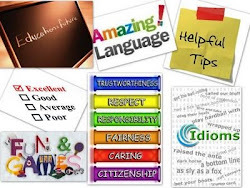 English Teaching Zone: English Metre – A nice technique to combat L1 use in the classroom. English Metre – A nice technique to combat L1 use in the classroom. The avoidance of L1 use has always been a controversial issue in ELT. Research has shown that there are positives and negatives but my scope today is the L1 use in groups that are able to have an English-only environment. For students, an entire class in English offers additional opportunities to hear the language. The English used for explanations and instructions represent "real" English because students actively listen how to use a grammar point or vocabulary word, or how to conduct an activity, for example. When they use the new material or complete the activity correctly, this boosts confidence. They can measure comprehension through success. Hence, there is no reason for students to use L1 in class if they are able to do that in English. Having in mind this scenario teacher Fabiane and I came up with a technique called English Metre which favors the reinforcement of positive behavior. The technique is simple. Each student is given a paper ruler and at the end of every lesson they are invited to color it according to their English contribution to the lesson (i.e. a student who had an excellent participation will color three centimetres whereas another student who used more L1 than desired will color just one centimetre). The technique has proven to be very effective so far and students feel very proud of their colored centimeters. The picture above illustrates a suggestion of board. Special thanks to Fabiane for her great board!